lalaforfashion: Aliona Doletskaya to be the next editor of American Vogue? Aliona Doletskaya to be the next editor of American Vogue? I once heard an old Chinese proverb which roughly translates into: ‘in times of need, buy a loaf of bread and a flower". To me this flower has always been a copy of Vogue. In recent years, I admit, I lost touch with the US and UK editions....or maybe Vogue has lost touch with me? Among other things..Vogue became irrelevant and completely out of touch with the woman of today. It is the likes of Grazia and Marie Claire that are offering the right mix of reality and fashion fantasy! 1) Unlike her counterparts in other editions, Aliona has not lost touch with the REAL woman – she knows the difference between aspirational and unattainable and avoids the latter. 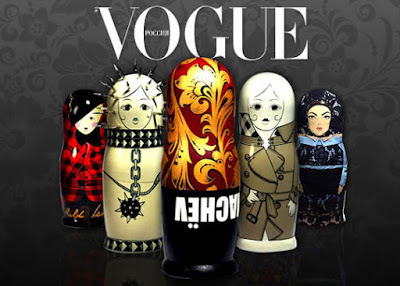 2) I actually read Russian Vogue from cover to cover: it’s opinionated, smart and edgy! 4) She is one tough and intelligent cookie with a Ph.D. in comparative linguistics from Moscow State University. 5) Lastly, in times of recession the world needs an injection of over-the-top Eastern Glamour – it’s on the streets of Moscow that you see effortless chic, and only in Russia can a woman look fabulous in a mink coat covered in embroidered flowers! I say bring it on!